Whether lifelong resident and professional fishing guide Jeff Greene of Montgomery County, Maryland is alone on the Upper Po-tomac River or Susquehanna River fishing from his custom jet boat, guiding clients for trophy smallmouth bass or fishing other bodies of water around the United States like his favorite fishing destination the Florida Keys, his love for fishing and the outdoors has always been a big part of his life. Looking back Some of his earliest memories fishing were with his Grandfather on Grand Lake in Grove Oklahoma. That's where Jeff and his grandfather chased catfish, crappie and white bass. Jeff would spend summer vacation with his grandparents, who managed the Honey Creek Resort and Motel in Grove Oklahoma on Grand Lake. That’s where he started to hone his skills and become the fisherman he is today. After graduating from High School Jeff went to and graduated from Glenville State College In Glenville West Virginia. During this time period Jeff never stopped fishing. The state of West Virginia had a lot of water that offered great fishing opportunities. After college Jeff spent 14 years as a police Officer with the Washington DC Police Department. During his police career Jeff thrived as a second generation police officer with MPD. Even as a police officer Jeff fished as much as he could and never lost the passion for fishing. In fact the passion for fishing grew even more as he got older. In 2014 Jeff really took his abilities of fishing to the next level. He started a small fishing guide service, which later became Shallow Water Fishing Adventures LLC. Now a days Jeff can be found fishing out of his custom jet boat year around on the Upper Potomac River and Susquehanna River chasing monster smallmouth bass. Jeff enjoys every aspect of being a professional fishing guide. 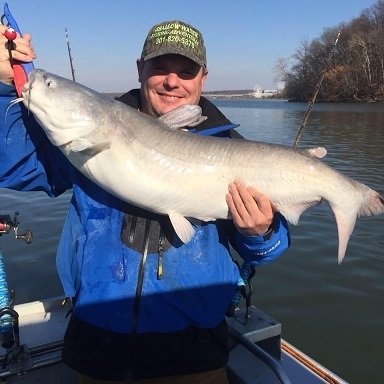 Being a fishing guide on the Upper Potomac River and Susquehanna River has brought tremendous satisfaction to Jeff's life. He enjoys nothing more than to see one of his clients hook up with a trophy size smallmouth bass. Jeff's favorite soft plastics, colors and sizes. Jeff's other STC lures he uses.